Original Editors - Emily Buckingham, Martina Riney Students from Bellarmine University's Pathophysiology of Complex Patient Problems project. Scurvy is a nutritional disease caused by a severe deficiency in vitamin C.
Vitamin C, also known as ascorbic acid, is a water-soluble vitamin found in food that is necessary for healthy growth and development. A mutation in the gene coding for L-gulonolactone oxidase occurred, which no longer allows the human body to synthesize vitamin C. Thus, making it necessary for vitamin C to be taken in through the human diet to ensure the body is able to aid in wound healing, scar formation, repairing cartilage, bone, and teeth, and the ability to absorb iron. The vitamin acts as an antioxidant to help protect cells from damage induced by free radicals. Free radicals are formed when the body converts food into energy. The body is also exposed to free radicals in the environment such as smoke inhalation, air pollution, and ultraviolet light from sun exposure. For the body to make the collagen needed to increase wound healing and scar formation, vitamin C is needed in an everyday diet. Vitamin C improves the immune system by increasing the absorption of iron from plant-based foods which helps protect the body from disease. Signs of deficiency typically appear after one to three months and may overlap with infectious, hematologic, or rheumatologic diseases. Today, scurvy is a much less common diagnosis and is typically seen in older adults who lack proper nutrition especially a diet with limited intake of foods enriched with vitamin C. According to an article, written by Anita Carr and Balz Frei, found in The American Journal of Clinical Nutrition, stated that approximately 25% of adults in the United States consume less than 60 mg/day of vitamin C and approximately 10% intake less than 30 mg/day. Consuming less than 10 mg/day can lead to the diagnosis of scurvy. The following populations are at increased risk for a vitamin C inadequacy that could develop into a diagnosis of scurvy without appropriate dietary management. Osteopenia - osteopenia is defined by bone densitometry as a T score -1 to -2.5. There are many causes for osteopenia including calcium and vitamin D deficiency and inactivity. Genetics plays an important role in a person's bone mineral density and often Caucasian women with a thin body habitus who are premenopausal are found to have osteopenia. Iron deficiency - As the name implies, iron deficiency anemia is due to insufficient iron. Without enough iron, your body can't produce enough of a substance in red blood cells that enables them to carry oxygen (hemoglobin). As a result, iron deficiency anemia may leave you tired and short of breath. Folate deficiency - Folic acid (vitamin B9) works with vitamin B12 and vitamin C to help the body break down, use, and make new proteins. The vitamin helps form red and white blood cells. It also helps produce DNA. Folate is not stored in the body in large amounts, your blood levels will get low after only a few weeks of eating a diet low in folate. Plasma levels: A fasting serum ascorbic acid level greater than 0.6 mg/dL rules out scurvy. Scurvy generally occurs at levels below 0.1 mg/dL. Leukocyte levels: The level of vitamin C in leukocytes more accurately correlates to tissue stores compared with serum levels, because these cells are not affected acutely by circadian rhythm or dietary changes. A level of zero indicates latent scurvy. Levels of 0-7 mg/dL reflect a state of deficiency. Urinary levels: A more commonly used method is the ascorbic acid tolerance test, which quantitates urinary ascorbic acid over the 6 hours following an oral load of 1 g of ascorbic acid in water. Ground-glass appearance of cortex -- The cortex becomes thin and the trabecular structure of the medulla atrophies and develops a ground-glass appearance. The zone of provisional calcification becomes dense and widened, and this zone is referred to as the white line of Fränkel. The epiphysis also shows cortical thinning and the ground-glass appearance. Image reprinted with permission from Bruce M. Rothschild, MD, Northeast Ohio Medical University, published by Medscape Drugs & Diseases (http://emedicine.medscape.com/), 2016, available at: http://emedicine.medscape.com/article/125350-overview. The primary cause of scurvy is inadequate intake of vitamin C. When intake level falls below approximately 10 mg/day, the risk for diagnosis of scurvy increases and typically symptoms will begin within one to three months once the total body vitamin C pool falls below 350 mg.This level is reached when the diet is completely lacking vitamin C for 60-90 days. Individuals with poor diet with limited intake of vitamin C are more susceptible to developing scurvy. Hypotension may be seen during the late stages of scurvy in response to vessels inability to constrict in response to stimuli. Complications in the heart can arise which include cardiac enlargement, electrocardiographic (ECG) changes, hemopericardium, and sudden death. Heart failure due to high-output can be seen in response to anemia. Anemia is present in 75% of the known cases of scurvy. Anemia appears in this population because of the blood loss into tissues, coexisting dietary deficiencies, malabsorption, and intravascular hemolysis. If teeth have been erupted, gum hemorrhage is possible. The tissue surrounding the upper incisors are most commonly affected and present with a blue or purple color and a spongy feeling. Loose teeth can also be seen with a diagnosis of scurvy. Gum swelling, friability, bleeding, and infection can occur when loose teeth are present. Anorexia is sometimes seen with scurvy diagnoses; therefore, weight loss is commonly seen. A submucosal hemorrhage may be shown with an upper endoscopy. Several skin problems can be noted with a diagnosis of scurvy. An early symptom is appearance bluish spots similar to bruises surrounding hair follicles on the shins, known as perifollicular hyperkeratotic papules. The hair is usually twisted like a corkscrew and very brittle susceptible to breakage. As the disease progresses, large patches of papules can form larger areas of bruising known as ecchymoses or purpura shown in the picture below. Vitamin C deficiency affects the production of collagen which can decrease efficiency of wound healing. This can affect new wounds and also decrease the integrity of old scars, leaving them at risk for skin breakdown. Sometimes bleeding within the joints can occur leading to painful hemarthroses. 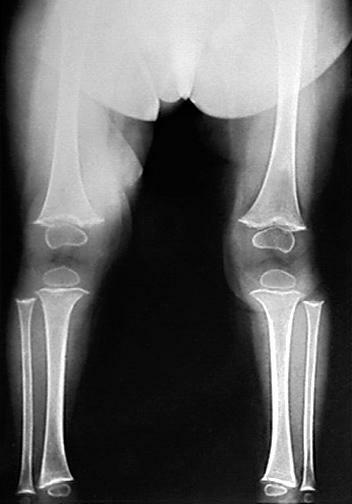 A subperiosteal hemorrhage can be palpable along the femur and sometimes the tibia in infants. If bleeding occurs in the femoral sheath, neuropathies can be seen and if there is bleeding into the muscles, woody edema can be present. Protrusion of the eyeball occurs due to an orbital hemorrhage and can be seen in the diagnosis of scurvy. Other ocular impairments can be seen which include dry eye similar to the diagnosis of Sjögren syndrome, subconjunctival hemorrhage, and bleeding in the eyelid, retrobulbar space, and periorbital are. Late in the diagnosis scleral icterus can be caused by hemolysis along with pale conjunctiva. According to current evidence, the only known effective treatment for scurvy is vitamin C replacement therapy which requires over infusing the body with ascorbic acid. In most adults, saturating the body with vitamin C can be achieved with 250 mg of vitamin C four times a day for at least a week. Typically, bleeding stops within 24 hours, the body becomes saturated within a few days and petechiae resolves within two weeks. Symptoms will resolve once the body stores of vitamin C are restored. The Recommended Dietary Allowance (RDA) suggests the amount of each vitamin an individual should intake daily to prevent a vitamin C deficiency The amounts listed should be used as a general recommendation but it should be understood that the correct amount is different for each individual and could vary based age and gender. Pregnancy and illnesses can also affect the amount of vitamin C needed in one’s diet. The table below lists the recommended daily intake of vitamin C based on age, gender, pregnancy. Dietary management based off the above daily intake recommendations is the best way to prevent a vitamin C deficiency which will decrease the risk for developing scurvy. Dietary Management/Food Sources Vitamin C can be found in some foods naturally and other foods are fortified with vitamins. Table 2 lists the fruits and vegetables that contain naturally high in vitamin C content. Many cereals and beverages are fortified with vitamin C. Checking food labels can provide information on the amount of vitamin C contained in the product. Table 2. Fruits and vegetables that contain high amounts of vitamin C.
When choosing foods high in vitamin C, it is also important to consider how the food is prepared. Storing the food for long periods of time or cooking the product a certain way can reduce the amount of vitamin C the food contains. The best source of vitamin C is found most when consuming raw fruits and vegetables with high daily values. Cooking losses may be reduced by microwaving or steaming the food. Light exposure can also reduce the amount of vitamin C found in foods. According the NIH, juices kept in cartons should be chosen rather than juice contained in a clear bottle. There are no direct physical therapy interventions for Scurvy. The patient may be referred to physical therapy for the treatment of impairments caused by Scurvy. These may include joint pain and stiffness, musculoskeletal pain, and musculoskeletal weakness, (particularly in the lower extremity). Cole JA, Warthan MM, Hirano SA, Gowen CW, Williams JV. Scurvy in a 10-Year-Old Boy. Pediatric Dermatology. 2011;28(4):444-6. Authors: Cole JA, Warthan MM, Hirano SA, Gowen CW, Williams JV. Scurvy, or hypovitaminosis C, is an uncommon condition that exists today primarily within certain unique populations - particularly elderly subjects, patients with neurodevelopmental disabilities or psychiatric illnesses, or others with unusual dietary habits. This case highlights that the presence of scurvy should not be forgotten, because of its presence among susceptible populations. Scurvy can present with clinical manifestations that include dystrophic or corkscrew hairs, gingival hyperplasia, and weakened blood vessel walls, causing bleeding in the skin, joints, and other organs. MRI of knees revealed significant deep soft tissue inflammatory change. Child was struck by a surfboard approximately 4 weeks earlier, causing bruising and swelling around his left knee. Limited diet, eating only hamburgers, Wheat Chex, Pop Tarts, oyster crackers, and pancakes. Patient took no vitamins or supplements and drank only water. Outcomes: Within 24 hours of starting the L-ascorbic acid patient showed clinical improvement. Outpatient follow-up showed normalization of L-ascorbic acid levels and no remaining clinical features of scurvy. ↑ Wax E, Zieve D, Ogilvie I. Vitamin C [updated Feb. 2, 2015; cited 2016 April 8]. Available from: https://www.nlm.nih.gov/medlineplus/ency/article/002404.htm. ↑ Carr AC, Frei B. Toward a new recommended dietary allowance for vitamin C based on antioxidant and health effects in humans. The American Journal of Clinical Nutrition. 1999;69(6):1086-107. ↑ 5.0 5.1 Goebel L, July M. Scurvy Overview: Prognosis 2015 [updated Sep 23, 2015; cited 2016 April 5]. Available from: http://emedicine.medscape.com/article/125350-overview#a7. ↑ 6.0 6.1 Carr AC, Frei B. Toward a new recommended dietary allowance for vitamin C based on antioxidant and health effects in humans. The American Journal of Clinical Nutrition. 1999;69(6):1086-107. ↑ 7.00 7.01 7.02 7.03 7.04 7.05 7.06 7.07 7.08 7.09 7.10 7.11 7.12 Wax E, Zieve D, Ogilvie I. Vitamin C [updated Feb 2, 2015; cited 2016 April 8]. Available from: https://www.nlm.nih/gov/medlineplus/ency/article/002404.htm. ↑ 8.0 8.1 8.2 Alqanatish JT, Alqahtani F, Alsewairi WM, Al-kenaizan S. Childhood scurvy: an unusual cause of refusal to walk in a child. Pediatric rheumatology online journal. 2015;13-23. ↑ Karaguzel G, Holick MF. Diagnosis and treatment of osteopenia. Reviews in endocrine & metabolic disorders. 2010;11(4):237-51. ↑ Mayo Clinic Staff. Iron Deficiency Anemia 2014 [updated Jan. 2, 2014; cited 2016 April 8]. Available from: http://www.mayoclinic.org/diseases-conditions/iron-deficiency-anemia/basics/definition/con-20019327. ↑ Wax E, Zieve D, Ogilvie I. Folate Deficiency [updated July 14, 2015; cited 2016 APril 8]. Available from: https://www.nlm.nih.gov/medlineplus/ency/article/000354.htm. ↑ Nguyen-Khoa D-T, Patel P. Vitamin K Deficiency [updated Dec. 18, 2015; cited 2016 April 8]. Available from: http://emedicine.medscape.com/article/126354-overview. ↑ 13.0 13.1 Goebel L, July M. Scurvy Treatment and Management 2015 [updated Sep 23, 2015; cited 2016 April 5]. Available from: http://emedicine.medscape.com/article/125350-treatment. ↑ 14.0 14.1 Goebel L, July M. Scurvy Medication 2015 [updated Sep 23, 2015; cited 2016 APril 5]. Available from: http://emedicine.medscape.com/article/125350-medication. ↑ 15.0 15.1 15.2 15.3 Goebel L. July M. Scurvy Workup 2015 [updated Sep 23, 2015; cited 2016 April 5]. Available from: http://emedicine.medscape.com/article/125350-workup#showall. ↑ 16.0 16.1 Lau H, Massasso D, Joshua F. Skin, muscle and joint disease from the 17th century: scurvy. International Journal of Rheumatic Diseases. 2009;12(4):361-5. ↑ Goebel L, July M. Scurvy Background 2015 [updated Sep 23, 2015; cited 2016 April 5]. Available from: http://emedicine.medscape.com/article/125350-overview. ↑ 18.0 18.1 18.2 Goebel L, July M. Scurvy Clinical Presentation 2015 [updated Sep 23, 2015; cited 2016 April 5]. Available from: http://emedicine.medscape.com/article/125350-clinical. ↑ Ngan V. Scury 2005 [updated Nov. 9, 2015; cited 2016 April 8]. Available from: http://www.dermnetnz.org/systemic/scurvy.html. ↑ Goebel L, July M. Scurvy Differential Diagnosis 2015 [updated Sep 23, 2015; cited 2016 April 5]. Available from: http://emedicine.medscape.com/article/125350-differential.